Hey everybody, it's Truffles! 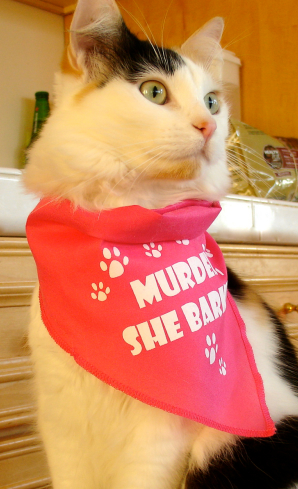 Instead of my usual "Truffles Interviews" graphic, this week I asked Mommy to use this fun picture she took of me in my new Murder, She Barked bandana. I got it because I'm a member of the Murder, She Barked Street Crew. Your pet can get one too; details are below! I hope you enjoy my interview with Twinkletoes; she's the cutest little calico! Welcome, Twinkletoes! Can you tell us how you came to live with Holly? Thank you, Truffles! It's great to be here. No one has ever interviewed me before. I was born in a house where a lot of cats and dogs lived. I was only a kitten when some people arrived and starting taking my friends away. The dogs barked warnings to us! My mom said to run for it, and we did. We zoomed out the door behind her. People chased us every which way, so I don't know what happened to my mom or my sisters. I walked for a long time. Happily, I'm pretty good at catching mice, and they're quite tasty but I do prefer to sleep inside where it's nice and cozy. I just kept going until I reached a town with a big stone building. People sat on the front porch with dogs and cats. I watched them for a while, and some of them even talked to me. It seemed like a pretty nice place. The more I thought about it, the more I wanted to live there. A woman with gray hair brought me a dish of food, and let me tell, you, it was way better than mice! So when it got dark, I just walked inside and looked around. Nobody stopped me. I snuck through a couple of cat doors that led upstairs and found a whole apartment, as big as the house where I used to live. It was great! I curled up on a big, cushy chair and slept better than I had since the day I left my mom. The gray-haired lady was very nice to me. She helped clean my fur, fed me every day, and let me live in the apartment. Somehow, I felt like something would happen. Like I was waiting for someone. Sure enough, Holly arrived, and I adopted her immediately. She really needs a cat. I sleep on Holly's bed. She feeds me when she wakes, a habit that I encourage. We live in the Sugar Maple Inn, so there are always a lot of friendly people around to tell me what a pretty kitty I am. I'm not very vain, but that's always nice, don't you think? I patrol for mice, but I haven't had too much luck. The squirrels outside fascinate me, but there's a cook at the inn who makes food just for cats. I'd much rather eat that. Still, I stalk squirrels once in a while, just to keep in shape, you know? I like hanging out at the registration desk so I can see who checks in. A lot of people bring their kitties with them. There's even a cat's only wing called the Cat's Pajamas. I've snuck into a couple of those rooms when they're being cleaned. Did you know they have catwalks near the ceilings? And screened porches with real trees inside for cats to climb! I've stolen a catnip toy or two from the welcome baskets. Shh, don't tell! How did you get your cute name? I'm pretty light on my feet. Especially when it comes to walking on railings. It scares some people but I don't know why. Don't all felines like to walk on high ledges? Tell us about your first adventure, Murder, She Barked...how do you assist Holly in solving a murder? Poor Holly. People can be so helpless. I have to admit that Trixie, the Jack Russell, did a lot to assist Holly. I try so hard to warn her when people with bad intentions are around, but she's not adept at picking up my signals yet. I had to smack one clue right on the floor to get her to pay enough attention to it. Honestly! One of the really cool people at the inn is Zelda. She works at the registration desk, but she's really an animal psychic. It's fun being able to communicate with a person! The only problem is that Holly doesn't believe Zelda. She even told me she thinks Zelda might have a screw loose! It's so frustrating. There were a lot of nice dogs where I was born, so I like dogs. Trixie is a little bit bigger than me, but not too much. We play together when I'm in a chasing mood. And she likes watching TV, just like I do. I even licked Gingersnap's nose today! LOL! She's a golden retriever who is the canine ambassador at the Sugar Maple Inn. You just have to know how to train dogs. There's talk about making me the feline ambassador at the inn! There's a spot in the sitting room of the inn where the sun shines just right. It's nice and warm and the perfect place for a daytime nap. People don't know how to play with my favorite toy. They hold the stick end in their hand and flick around the fuzzy ball that is on the end of a string. It's much more fun to seize the fuzzy little ball in my mouth and drag the stick behind me. I love dragging things that are way bigger than me. And I love water! There's nothing more fun that sticking my paw into running water. Krista doesn't tell us too much in advance. I understand there's a ghost involved in the second book, though. And a Siamese cat named Holly Golightly! Your mommy is right! 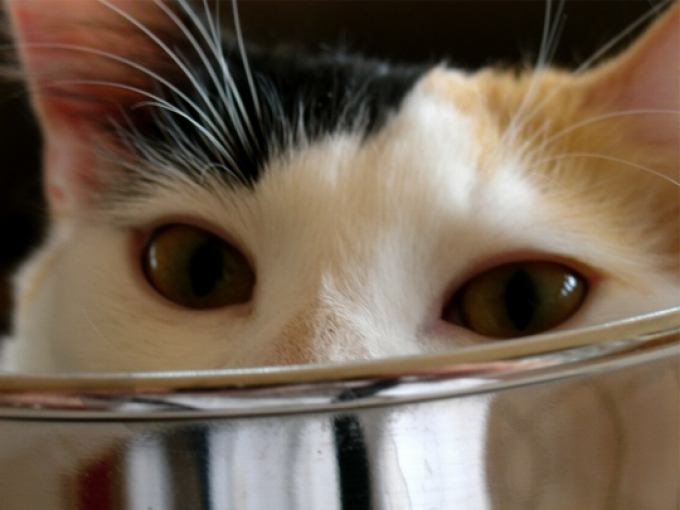 Holly says I have calico quirks. I can't imagine what she means. Doesn't every cat bury her food when she's had enough? I like to jump into pots and boxes and just about anything I can fit into. Do you like that, too? And there's nothing that I don't check out. Are you fascinated by everything that comes into your home? I open cabinets and stick my head in bags and boxes and suitcases. You just never know what you might find. To celebrate the launch of Krista’s new series, Buttercup and her siblings are looking for dogs and cats to join their street crew. They're giving away Murder, She Barked bandanas to dogs and cats to promote the book. One lucky dog or cat who leaves a comment here today (it’s okay if their people leave comments for them) will win one, too! 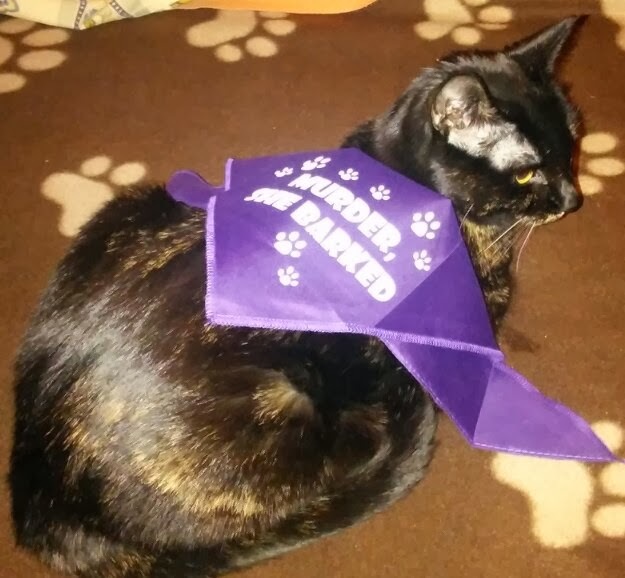 Photos of winners (hopefully wearing their new Murder, She Barked bandanas) will be posted on http://kristadavis.com/paws-and-claws-mysteries/murder-she-barked-street-crew.html and on this Pinterest board! 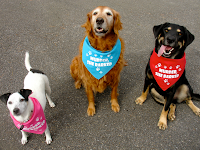 http://www.pinterest.com/kristadavisbook/murder-she-barked-street-crew/ board so your dogs and cats can share with their friends. Krista Davis’s new series for animal lovers debuts on December 3rd, with MURDER, SHE BARKED. Like her characters, Krista has a soft spot for cats, dogs, and cupcakes. She lives in the Blue Ridge Mountains of Virginia with three dogs and two cats. The Diva Frosts a Cupcake is the seventh book in her Domestic Diva Mystery series. Three of those books have been nominated for Agatha awards and three have made the New York Times Bestseller list. This looks fun! I must check out the books!! Awesome! It does look like fun, I agree! I love your pics also! Very cute! Great interview! It was nice to meet you Twinkletoes. I'm very excited to start this new series and looking forward to meeting the rest of the crew. P.S. I'm a Virginia girl too! Those are neat bandanas. Any of us woofies would be proud to wear one. Such a cute interview! Twinkletoes is quite articulate and seems like a very personable young lady. I look forward to reading this series of books! They sound purr~fectly wonderful. this was great! i love twinkletoes' name! Awww...Truffles...you are so cute! Great interview...sounds like a great book! What a fabulous interview! I have four dogs (all are relatively small) and they are all arguing over who would get to be on the Street Team and wear the bandana if they won. I have assure them that the bandana would fit all of them, but we'd have to be extra careful with Oyo, to make sure it didn't drag. He's a Yorkie and isn't very big (but don't let him know I told you that, he thinks he's a big dog/person combo). They need to learn to share better anyway. After much harumphing among themselves, they agreed. They are most impressed with Twinkletoes. They would very much like to play the chasing game with her. They play the game with our cat, CallieKitty sometimes. CallieKitty is very, very fast and can jump very high. They think she might be part squirrel because she climbs trees 1,2,3 and she's gone. You can reach me on behalf of Enki, Oyo, Kefa, and Deja Vu at michelle_willms(at)yahoo(dot)com. Thank you all so much. This was my first interview so I was a little nervous, but Truffles was super nice! Good luck to all of you!